Iowa agricultural producers interested in developing more habitat for Monarch butterflies by adding additional soil and water conservation practices to their land have until May 19 to sign up at their local USDA Service Center for planning and funding assistance. A sampling of eligible conservation practices through USDA’s Monarch Butterfly Habitat Development Project includes: brush management, conservation cover, field borders, and upland wildlife habitat management. Your local Natural Resources Conservation Service (NRCS) office can help you develop a plan to address Monarch habitat or other resource concerns, as well as financial assistance opportunities. Iowa is one of ten states along the Monarch’s core migration route and primary breeding range. USDA’s Monarch project is focusing on plantings of milkweed and Monarch nectaring forbs in wetlands and other marginal lands. The latest ISU Acreage Living Newsletter has more information. “We want rural landowners to consider odd areas or unproductive areas – big or small – that would make a difference to the population,” said State Biologist James Cronin, with NRCS in Des Moines. USDA is a partner in the Iowa Monarch Conservation Consortium, which includes conservation organizations, state agencies, companies and Iowa State University, who are working together to research options to establish and maintain Monarch breeding habitat best suited for different types of land use scenarios in the state. There are two important pollinator habitat types: food resources and nesting and egg laying habitat. USDA can help you establish both of these habitat types. The attractiveness of pollinator habitat is maximized on sites > ½ acre in size with a diversity of plants and > 45 percent forb cover. Forbs are plants like milkweed, clover and even sunflowers. This method of habitat improvement should not be implemented within native, remnant habitats. A stand with a minimum of 11 species should be established, including at least three flowering species from each of the three bloom periods (spring, summer, and fall). This will provide nectar and pollen food resources for pollinators throughout the season. The stand should also include a minimum of one legume species and a minimum of one bunchgrass (big bluestem, little bluestem, etc.) or clump-forming sedge (tussock sedge, etc.). The host plant(s) of a desired pollinator should also be included in the seeding. For example, if monarch butterflies are desired a seeding should include milkweed plants that the larvae feed on. Pollinator habitat should be PLS (Pure Live Seed) seeded to a minimum of 40 seeds/square foot, of which 20 seeds/square foot should be forbs. (You can get more information from the Iowa NRCS. Refer to the NRCS 327 Conservation Cover Standard and Specification as well as the Native or Introduced Seeding Calculators to develop a mix of site appropriate species) Plantings may be broadcast seeded, hydroseeded, no-till drilled, or hand seeded. Undisturbed soil, duff and woody debris are important pollinator habitat attributes. Stable areas in full sun with good air circulation are preferred nesting/egg laying sites. A diversity of nesting/egg laying habitat (exposed soil, woody debris, herbaceous clumps/tussocks, host food plants, bee blocks, twig bundles, etc.) should be represented as site conditions allow. Nesting and egg laying habitat should be located in close proximity to food and water resources. If you seeded an annual plant species , make sure the check to see if these plants are self-seeding themselves are if they need to be reseeded. Pollinator habitat should receive little to no disturbance, including the turning of machinery or driving within pollinator habitat. Pesticide and herbicide use on or near a pollinator planting can have significant negative effects on pollinator populations. 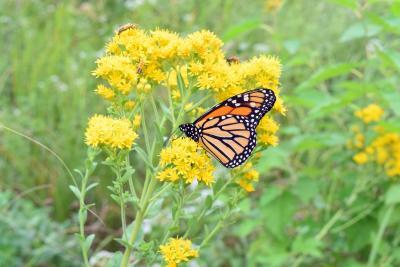 Plant your pollinator habitat where chemical drift will not be an issue. You can mow or hay as an alternative pest control method. If carefully planned, you can also periodically use prescribed fire to maintain diversity within pollinator habitat. Some pollinator eggs or larvae may be killed during prescribed burns or other management actions. To avoid this, no more than 1/3 - 1/2 of the stand could be mown, hayed, or burnt in a given year, every 3-6 years. Try to mow, hay or burn during the dormant season (November - March) management to promote forb diversity and to reduce risks to pollinators and their nests. In addition to this special project, USDA offers landowners several other opportunities to receive financial assistance for planting pollinator habitat. These include: Environmental Quality Incentives Program, Conservation Stewardship Program, Agricultural Conservation Easement Program and Conservation Reserve Program. Your local NRCS office can help you with your habitat and program questions. For more information, or to find your local NRCS office, visit the Iowa NRCS website at www.ia.nrcs.usda.gov.